The Abraham Darby was a product of David Austin roses in the United Kingdom in 1985. It was created by breeding the hybrid tea rose Aloha, with the floribunda Yellow Cushion rose. The result is a stunning pink to apricot colored bloom that has a very strong fragrance of a fruity nature. The blooms are quite large, averaging 5 inches in diameter and they are very full blooms with upwards of 40 or more petals. The Abraham Darby is sure to find a home in just about any spot within your garden. Abraham Darby roses are considered shrub roses, but they can grow quite tall, reaching upwards of 10 feet or more. For this reason they tend to lend themselves better to spaces where they can be trained to grow up supports or structures, which is why we have this article in the climbing roses section. 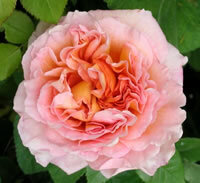 The Abraham Darby is a near thornless rose with medium green leaves that can get quite dense. This variety is winter hardy in zones 5 through 10 and it is only vulnerability is to rust. The Abraham Darby is a very prolific bloomer and if you take the time to deadhead the spent blooms, you will be pleased to see that it will bloom near continuously throughout the entire growing season. Like most types of roses that bloom frequently, the Abraham Darby will do best if you give it a nice sunny spot to grow in. It can survive in a partial shade location, but you are likely to discover that if you plant it there, it will only give you a lackluster performance. The whole point of growing roses is to get as many beautiful blooms as you possibly can right? 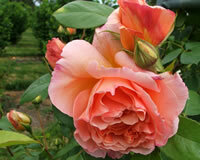 You should also choose a location for your Abraham Darby roses that gets really good airflow. Air circulation is critical for the health and well-being of most roses and often times I see roses placed in poor locations that are sheltered. Good air circulation helps to keep the foliage of your roses dry between waterings and rainfalls. If the leaves stay too damp and never get to dry out, this can be a invitation for various forms of diseases and pests to infect your roses. Give your roses the proper location and they will in return give you years of blooms you are unlikely to forget. Planting your Abraham Darby is easy and straight forward and you can follow typical guidelines as you would any other rose bush. If you received your plant as a bareroot, dig the hole wide enough so that you can fully extend the roots without having to force them into the hole. Dig the hole deep enough so that the bud union is about an inch below the surface of the soil when planted. For bareroot plants, you also should make a mound in the center of the hole so that when you set the plant in, the roots can spread out at a downward angle. A good tip for planting is to pick up a bag of a good organic compost from your local garden center. Most often they are reasonably priced. When you dig up the soil for planting, put the soil in a wheel barrow and mix it 2 to 1 with the organic compost. This is a great way to give your roses a big boost to their new location. The compost will help amend your soil, giving your roses exactly what they crave. If you got your Abraham Darby roses in containers, dig the hole about twice the width of the container, and equally as deep so that the bud union stays at the same depth. 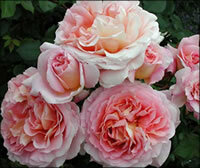 Caring for your Abraham Darby is the same process as you would any other rose. Roses in general need a lot of water to produce plentiful blooms, but not so much that they are constantly damp all the time. Usually a good rule of thumb is one good watering each week, however if Mother Nature is doing the job for you, don't overwater! You can check this by sticking your finger into the soil around the base of the plant. If it comes out damp, then the soil is still retaining moisture. Often I get asked how should I feed my roses? There are a variety of products on the market these days and depending on who you ask, you are likely to get a lot of different answers. If you are unsure of what to use, you really can't go wrong with a basic all purpose organic granular fertilizer. Your local garden center will carry this as well. I try to stay away from the liquid chemical fertilizers as I've discovered they can too easily burn many roses if not applied properly. 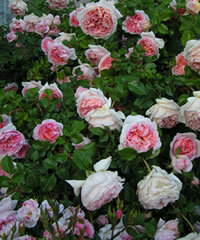 You can give your roses their first feeding in early spring, just as the leaves begin to develop. Most roses are fine with that. If you want to encourage additional blooms, you may feed them again just as the first big bloom starts to form, and once more around mid-July. Just be sure you allow at least 4 weeks in between feedings. You can prune your Abraham Darby roses in a variety of ways. Since it can grow quite tall compared to other shrub varieties, you may want to train it to grow around a support or structure. In that case you would prune it just like any other climbing rose. If you intend on keeping it more like a shrub, then you should practice the "open center" pruning method instead where you trim off all the dead or diseased canes, and then prune back the main canes to an outward facing bud. Trim off any lateral canes that overlap one another and keep the center of the shrub clear for the next season's new growth.